Last night, after months of anticipation, Scott unveiled the Moschino [tv] H&M collection, available online and in-store from November 8, with a star-studded extravaganza at Pier 36 in New York. The show space was transformed into NYC streets, replete with high-rise buildings, billboards covered with the campaign images and illuminated theatre signs emblazoned with the Moschino logo. 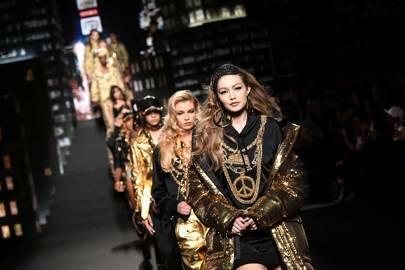 As Run-DMC’s “It’s Like That” blasted out, campaign star Gigi Hadid opened the show in a black hoodie printed with gold chains and a glittering gold puffer coat, followed by Stella Maxwell, Duckie Thot, Imaan Hammam, Dilone, Teddy Quinlivan, Jordan Barrett, Candice Swanepoel, Joan Smalls and Winnie Harlow. 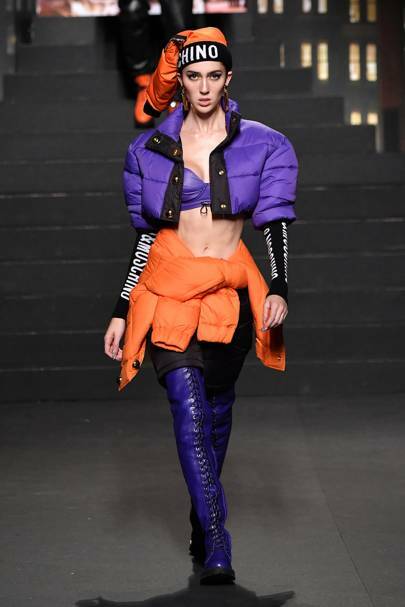 As Yolanda Hadid looked on proudly from the front row (joined by Marc Jacobs, Paris Jackson and Amanda Lepore) Bella and Anwar Hadid also hit the catwalk, clad in fitted leather. Up next: rainbow-hued furs, stonewash denim and plenty of gold, gold, gold. 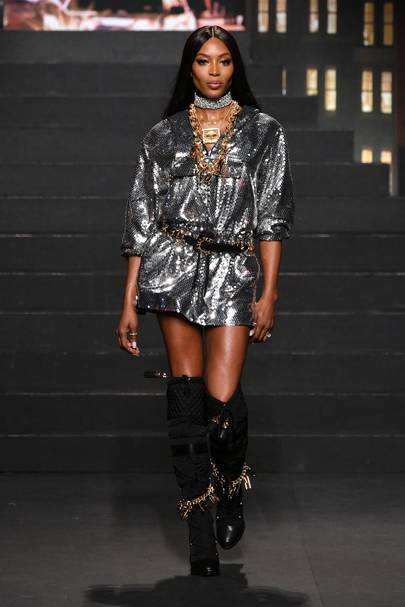 Topping off the stellar modelling line-up, Naomi Campbell closed the show in a sequined silver dress with black knee-high quilted boots – to rapturous applause. H&M confirmed its latest designer collaboration with Italian fashion brand Moschino, back in April 2018. The news was first revealed on the evening of April 14, at Jeremy Scott’s 11th annual party at Coachella music festival. The announcement came via an Instagram live call from Gigi Hadid to the designer, with both dressed in looks from the collaboration, giving a tiny taste of the playfulness and colour – synonymous with Scott’s designs – that we could expect to see come October. After Scott’s long-standing collaboration with adidas ended in 2017, this partnership offers fans a chance to snap up his designs again at a more accessible price point, with prices ranging from around £25 to £300. “I started with the thought of how to make it the most Jeremy Scott for Moschino collection ever,” the designer asserted. For the eagerly-awaited collection (show attendees descended on the pop-up shop like a crazed mob immediately after the finale), silhouettes are slashed, shapes are distorted and chains and logos are emblazoned across everything from T-shirts and jackets to boots. A collaboration with MTV plays with pop culture via a fresh logo mash-up in true Moschino style, subverting the MTV logo on hoodies and sweatshirts. 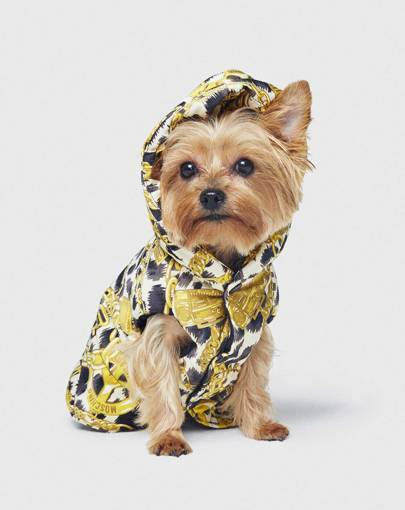 Constantly fusing high and low, Jeremy Scott believes in the “haute hoodie” and has created a dazzling parka dress that’s entirely covered in silver sequins. Vying for the position of the most blingy, standout piece in the collection is a gold leather biker jacket punctured with gold chains, not to mention a bustier twinkling with countless rhinestones. 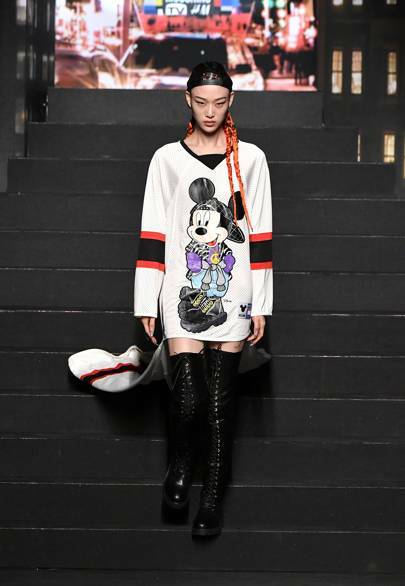 Metallics, logos and chains aside, familiar Disney characters also crop up in the collection. Patched onto a hoodie dress, Mickey hangs out with Donald Duck, Goofy and Pluto. Minnie Mouse is knitted into a fuchsia intarsia sweater dress, while a merino wool mesh knit dress has oversize patches of Donald and Daisy Duck. Earlier this month, H&M teased images from the campaign, shot by Steven Meisel (the first time the legendary photographer has worked with the Swedish retailer), which take inspiration from a ’50s salon show. Styled by Carlyne Cerf de Dudzeele, with hair by Guido Palau and make-up by Pat McGrath, the campaign features models Gigi Hadid (of course), Imaan Hammam, Vittoria Ceretti, Rianne Van Rompaey, Stella Maxwell and Soo Joo Park, lounging around a resplendent room, plush with gold chairs and a chandelier. See the Moschino[tv]H&M look book starring Jeremy Scott and his friends, family and muses including Dilone, Aquaria, Barbie Ferreira, Ami and Aya and Teddy Quinlivan, below.